Update, Oct. 2015: Merrell’s new version of this boot is the Merrell Women’s Captiva Buckle-Up Waterproof Boot and I rather like the seam that runs down the center front. It comes in black, dark brown and copper. I can report that my version of these boots is still as comfortable and as waterproof as when they were new. These Captiva Strap boots from Merrell are waterproof and as comfortable as slippers. No really, the footbed is made of something slightly squishy so they feel really lovely. They are knee high, zip all the way up and the calf was more generously sized than a few other boots I compared it to. The soles are grippy rubber and there is plenty of support for my fussy feet. The shape of the toe box means there is lots of room for movement. I brought these with me on a month long trip to England, Scotland and Ireland in November and I tempted fate by getting them at the last minute and not having a chance to break them in before we left. Yeah, a potentially stupid move on my part. But they were amazing, I didn’t get blisters or achey feet and I was warm and dry even after a few walks through very damp fields. The heel support did hit me a little higher than I would have liked and I was afraid they would rub but I was fine. Here is the thing though, I wish they looked a little nicer. They are undeniably comfort boots, they will work with a cute outfit but these aren’t boots that can be dressed up. (Not that my own opinion on this point has stopped me from trying.) Still, there a few touches that bug me. There is a faux strap wrap around the ankle with a decorative buckle which I like but halfway up there is a rivet and a few inches over that there is a metal tag that says, very small, “waterproof”. Why thanks, but I don’t think I need to be reminded of that every time I put them on. There is an elastic panel at the top but it’s on the outsides of the boot, I’m sure it’s located just there for a reason but not knowing what that reason is I wonder if they couldn’t have tucked it away on the inside to hide it away a bit. There is a small logo embossed as well, just below the ankle. All these little things add up to make the boot look a little less tidy than it could. All of that said, the other day I was waiting in line at an airport and I was admiring the pair of boots worn by a woman walking by. Turns out she was wearing these very same boots. Which I had on my feet at the time. So, maybe I’m being a little nitpicky about how I perceive that they appear. Overall they get incredibly high marks for comfort and utility (like, Pry Them From My Cold Dead Feet high marks, or maybe just Get Another Pair In Brown high marks). They will work nicely for tromping around in muddy fields, looking cute with dresses and warm leggings as well as walking for many more hours than you anticipated in an unfamiliar city in an attempt to find that specialty beer shop you read about. The Merrell Captiva Strap boots are available at Zappos and Amazon (affiliate link) in black and brown. I hover between a size 7 and 7.5 in shoes and I bought a size 7.5 in these, though the fit across the top of the foot has stretched and I occasionally wonder if the size 7 would have worked out as well. I have these and LOVE them. But I’m totally with you on wishing they looked just a smidge nicer. However, this winter has been so crappy and long that I’m at the point where I barely care anymore. I have them in brown, and I love them too! My custom foot orthotics fit in them too, something I have looked for unsuccessfully for a very long time. I have a friend who is obsessed with Merrells as of late. I’m a Born and all their sister companies follower. I like a bit more of a heel and they dress up and down easier for my lifestyle. That and most of their styles come in wide, so I can purchase my actual shoe size, 7.5W instead of 8s like I normally have to buy. I like the grungy/not-so-clean look normally (since I usually wear them with jeans/leggings and a tee), but have definitely avoided wearing them with skirts/dresses. But they’re such a great “everyday” book, I love them! Do you have a picture with them on? I am wondering where they hit on your calf. I recently spent WAY too many hours trying to find boots for my college-aged daughter who is studying in Philadelphia this term. Her boot zipper broke on day 1 in the middle of a snowstorm. She had no time to shop all over so I shopped online for her. It was really hard to separate out “cute” and “good in snow” ….in the end we went with good in snow and I sent her some LLBean boots. But her birthday is coming up and I think she’d like these with skinny jeans, or tights, maybe in brown. She is petite…about 5’1″ so I can’t get something too high. I usually shop at Amazon for everything; except shoes. Zappos is my go to. I recently bought boots on Amazon and it was fulfilled by Zappos since Amazon owns Zappos. Clearly that was a sign that I’m meant to buy shoes at Zappos. I’ve got the Merrell Captiva Launch boots, and it’s sad how quickly those cute little buttons popped off. They moved from “cute everyday boot!” to “dog park boot!” very fast, and that squishy footbed isn’t squishy any more. …so then I bought Pikolinos Verona, which is also super waterproof and CRAZY comfortable. The heels are sturdy and have some serious slip-proofiness to them. I am not a heel wearer and yet I’m happy walking the 3 miles to work in these puppies. BONUS: they sell them at Market Street Shoes, and there’s a 10% off coupon in the Chinook Book. win. Jen – Good to know! I don’t have custom orthodics but I do have some nicely worn in insoles that I occasionally use. Katie – Great advice. My toes fit in Borns strangely but I keep trying them on in the hopes that I’ll find one to love. I tried on a pair of Born boots when I was looking for these and I think they were in the final three! Tracy – Mine look like that too right now, a bit dusty. Between these and a few other pairs of shoes I’m going to need to invest in a good shoe brush to clean them. Kendra – I don’t have a photo with them on, but I can tell you I’m just over 5′ 1″ and have comparatively short legs and these boots aren’t too high on me (whereas lots of boots are). These hit about an inch below my kneecap. According to Zappos the shaft height on these is 14.5″. I am pretty confident in saying these wouldn’t be too tall for your daughter. By comparison I have some original (glossy) Hunter boots and the shaft height on those is 16″. They are not too tall for me while standing/walking but I cannot drive while wearing them because they hit me too high on the back of the knee when I sit. Amy – :) Zappos is certainly speedy, and they’ve never let me down. Bravecanary – Those are cute! Thanks for the recommendation on them. I can also say that ever pair of La Canadienne boots I’ve tried on have been startlingly comfortable, but I have not yet required boots with heels (soon, I think) so I have not found a reason to buy them. I love Merrill boots for PNW winters! My favorite pair of black thinsulate lined, waterproof boots were stolen. 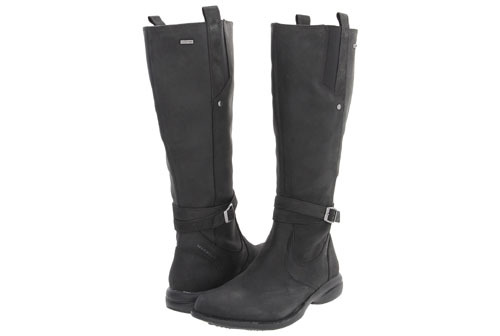 I bought another version of Merrills, because when it is 40 and raining, you want cute, comfortable, and waterproof! All Hail Merrill boots! I first got the black mid calf with cute buttons that fall off as mentioned above. I called Merrill and complained. They sent two envelopes full of new buttons. After loosing a few more. I hot glued em in. Problem fixed! They Are 5 years old now and still look pretty darn good. Last year I got the brown Captiva boots with the little waterproof sign on the back side. I absolutely love them. They need a little cleaning up for this winter but still are in very good shape for being two years old now. Im 5″4 135lbs and wear and 8. I think they are true to their size. The brown Captiva’s look awesome with ripped shinnies or jean skirts. I will continue to buy Merrill for a long time. Living in Wisconsin means you need to dress a little more practical while looking cute. The leather heal dressy boots I see everywhere may look OK now. But I guarantee you cant wear them when you need them most!